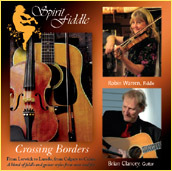 Crossing Borders, Spirit Fiddle's 6th recording, crosses regions and traditions in a unique collection of tunes in many styles. The poignant Leaving Lerwick Harbor and the Medicine Hat raindance sit beside French musette waltzes, fast-paced bluegrass hoedowns, Cape Breton tunes, and a popular song from the Civil War. Performers include Robin Warren on fiddle, Brian Clancey on guitar, David Goodhue on stand-up bass, and Zoel Sawyer on tomtom. Eleanor Townsend Memorial March and Jeanne were written by our favorite Canadian fiddler Calvin Vollrath. Jeanne is entirely in double-stops - there is no end to Calvin's genius on the fiddle. Medicine Hat, a tune written by John Durocher, is named for a town in Alberta, Canada. The Medley in A is a collection of tunes from Scotland and Cape Breton. Back Up and Push and Bully of the Town are bluegrass versions of traditional American folktunes. French numbers on the album include 2 musette valses Milagros and La Vraie Valse Musette, the popular song (especially during WW2) J'attendrai, and Astor Tango. Lorena entered the American psyche during the Civil War, where it caused heartbreaking homesickness on both sides, according to legend, resulted in so many desertions that soldiers were banned from singing it. It remains an emotion-filled song in the south, bringing back memories of the many young and promising lives lost by the confederacy. Leaving Lerwick Harbor is sad as well, one of those tunes that we just had to learn once we heard it. It's become one of our most requested numbers. Crossing Borders, the tune that inspires our album title ... well, you'll just have to hear it. It's a humorous tex/mex version of an old French tune, with too many fiddles having too much fun.